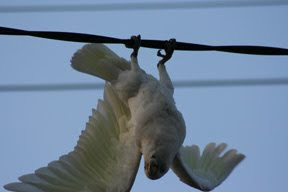 .......53 Buddhas and Me .................My Life Adventures.....: My Love / Hate Relationship with Corellas!! Now I must say I love nature and I really like birds living their lives flying freely to wherever they want to go. I have been known to say if I came back as an animal I wouldn’t mind being a bird. The different sound of the birds in the morning is lovely. “WELL NOT THIS MORNING AT 7.00AM”!!!! In our area we have a huge population of Corellas, chewing there way through lots of the new seeds on our trees in our many parks. As they fly from one area to another it is almost like the sound of a helicopter, it is quite an amazing sound. We this morning at 7.00am they decided to visit my street, in fact my tree and my electricity wire. I am glad none of them chewed a bit harder on the wires, it would have been a bit ugly plus our power would have been lost. Zoe usually barks like crazy at any birds when they are in the trees but she was just walking around looking up – dismayed at all the bl…y noisy birds chewing away. A lot of them were babies having lots of fun hanging upside down and chasing each other. They stayed about an hour flying and chewing between my trees and the trees across the road. Once the day started to warm up they all decided to head of, so away they went with their huge roar. I really hope they don’t decide to visit again tomorrow morning!!! ** “Davine Time” update – I really haven’t had a chance to get to indulge in my time yet today so I am going to climb into bed and catch up on reading some blog posts. I guess natures has its own way of making the things right :). best wishes, Lara.